Diesel Loverdose Tattoo is for women who know what it's beauty. 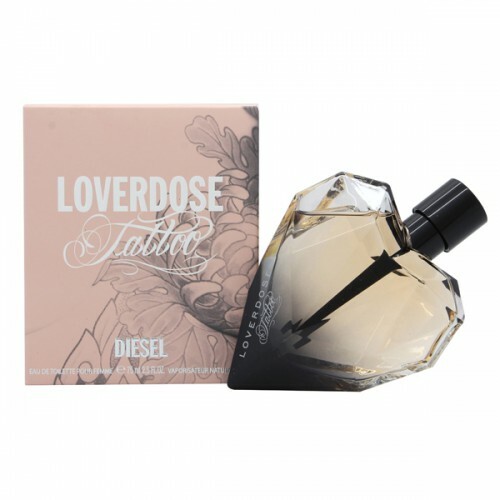 Diesel Loverdose Tattoo 75ml. Eau De Toilette is for women who know what it's beauty, attractiveness and sensuality, only what they need the most attention. Sweet milk flavor and a special aromatic flavor, which is ready to envelop you into the floral elements full of joy and enthusiasm. Diesel Loverdose Tattoo give your olfactory senses. Show you the way to properly taste, elegance and luxury. Perfume for a woman with whom discover how delicious fresh mandarin, bergamot or rose. Indulge jasmine and vanilla heritage that you have now at your fingertips. Perfume Diesel Loverdose Tattoo is deposited in a very original bottle which embodies the black crystal heart. Unique and mysterious process, with which you can safely go into the vortex of the night. Enjoy life to the fullest and keep themselves in the smell of Diesel Loverdose Tattoo. Floral fragrance for women with expressive oriental shades, released in 2013, the youth brand Diesel. The main idea of ​​the aromatic composition, created by Pascal Gauri and Anne Flipo, passion bordering on obsession. She compares perfumer with a tattoo - something intimate, almost metaphorical, inviting the world of secret desires and passions, because the true meaning of each tattoo is known only very mistress. Sensual, daring and a little mysterious fragrance, for a strong, knowing his own worth women, begins with a cascade of freshness radiated bergamot and mandarin sunny, with mild flavors of cool, slightly tart notes of ripe black currant. The fragrance opens slowly warms and honey, slightly bitter smell of orange blossoms, delicate, velvety rose and honey-sweet jasmine sambac. Rounding out the flavor is soft, sensual base of a little powdered creamy dairy notes, tonka bean haze and delicate, sweetish vanilla.